So, What Is A Personal Chef? A Personal Chef is someone who has a passion for cooking and comes to your home to share that love of fine food. Busy Mom's & Dad's who would like to spend more quality time with their family! Those struggling with new prescribed diets, such as low-sodium, low-sugar! Those who enjoy enteraining in-home without all the fuss! Someone looking for the special way to celebrate special times. Anyone who would like to eat healthier and Buy Time! How Do I Book My Own Personal Chef? Just call or E-mail and we can schedual a time for an initial consultation. In this interview we will go over food likes and dislikes, food allergies, and specific dietary needs. At this point we can put a customized menu for your approval. We will also choose a cooking date and sign an agreement of service. Payment is due when the "Agreement" is signed. Sounds Great, Can I Afford Such A Service? Of course. When you consider the cost of the groceries, time to plan the variety of healthy meals, shopping, cooking and clean up time, you'll find the cost quite affordable. Then you and your family can dine in the comfort of your own home, without the long waits of restaurant, with good-for-you food tailored expecially for you. I Enjoy Cooking But Don't Always Have the Time. Can I Use Your Service On A Part-time Basis? Absolutely! We are here to give you more time in your personal life. Our "Complete Package" option can provide you with 20 complete meals to supplement your own cooking when you are short on time or just need a break. I'm On A Diet... How Can You Help Me? Most of my menu items are healthy. Low fat, no salt, low sugar, all protien, vegetarian, strick portion sizes, are no problem at all. We will assist you in designing any style of menu to fulfill your dietary needs. How Will The Meals Be Packaged? 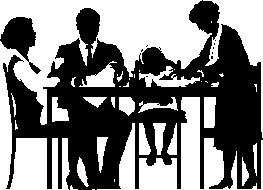 Your meals are packaged according to your preferences: family stlye, meals for two, or individually. They are packaged in aluminum, microwaveable trays, freezer bags or in your own reheating dish. Either way clean up for you is a snap. I will come into your home on a preschedualed cooking date to prepare your meals. I bring all the groceries, spices, equipment and cookware. All I need from you is the use of your stove, oven, a clean kitchen work area, and ample space in your freezer or refrigerator for storage. I Sometimes Like To Entertain... Can You Help With This? One of my favorite services is my private dinner party and Gourmet BBQ Menus.